The stack. The back catalogue. The never ending pile of shame. NovaGamer editors have previously posted their own thoughts and woes on this topic, but I started thinking more and more about managing this growing list of titles I haven’t played or finished in my library. Here are some cool resources I’ve come across when researching what other gamers are doing with their own piles of shame. 2. The Backloggery – This site allows you to enter games from any system, and assign played statuses like “unfinished”, “mastered”, etc. 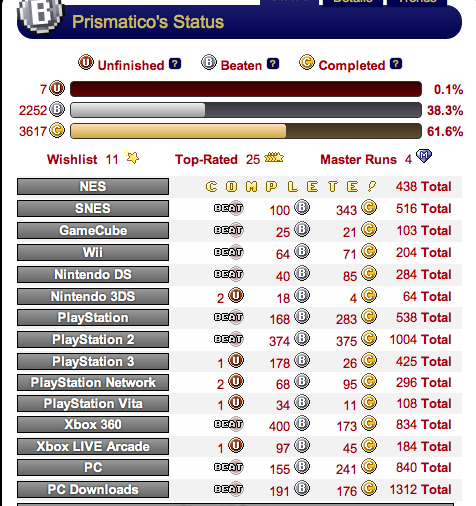 You get a gamer card that shows off your Uncompleted/Finished/100% Completed scores plus other details. This is one of my favourite finds because I can manually input just the games in my stack to keep a short list of all those games plaguing me. 3. How Long to Beat? – You can find out other users average times to beat games! 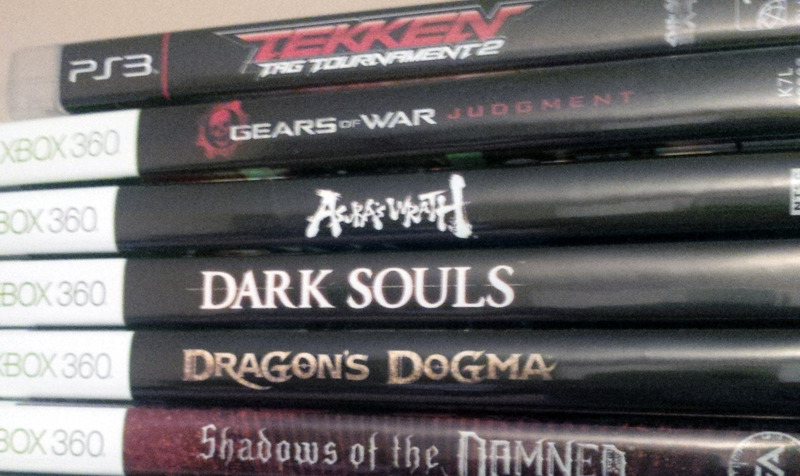 Got that stack like mine, where Asuras Wrath and Dragons Dogma sit next to each other, wondering which one you should play first? Knowing the length of a game may help decide which one to tackle first. Build a custom list of your own backlog, keep track of time played and help build the list of games. These sites aside, there are plenty of other ways to manage your backlog. Make a list. While the sites above may help you, you might also get suckered into inputting data instead of playing games. A notepad file, a quick piece of paper or even a whiteboard can keep a list of your titles that you need to finish. I keep a stack of games on top of my media shelf as a reminder of what needs to be played next. Older games at the top, newer at the bottom. Depending on your gaming tastes you may want to mix up the genres (no JRPGs back to back, please!) and be aware of games like World of Warcraft or other MMOs as they are essentially games without an ending. Don’t be afraid to archive an uncompleted game in your collection. Or is it going into the stack? Be smart and play the games that you enjoy. Finally, think before picking up that latest and greatest AAA title. Is it something you’re going to have time to play? Got tips or tricks for backlog management? Hit the comments and let us know! 8 titles in all. The downside here is that my Wii is still packed away, and 4 of those remaining 6 are RPGs. That’s rough. Not only do I not have it in me to play back to back RPGs, I also don’t have the endurance to play a lot of RPGs anymore. They were my favorite as a kid, and I still love them, I just don’t have 60 hours to spend on a campaign. This is why I’m so in love with FPS these days. Story modes of 8-12 hours means I can polish off a game in relatively good time. My current plan is to get Borderlands and Assassins Creed out of the way while I chip away a Final Fantasy 13. Then once I unpack the Wii (hopefully this weekend) I can resume Skyward Sword. Once all that’s done I can beat SMG2, and I’ll have nothing but RPGs left. Which means I’ll pick up other titles to play in between them… just not a new RPG. Until recently I had Xenoblade Chronicles and The Last Story in my stack – I had started both but they’ll sit on the shelf until I feel like I have time to play them all the way through (which is decidedly never). My biggest problem is that I still have PS2 games I want to play through – .hack and more – but have just archived for the sake of keeping them in the collection. I’m trying to make a conscious effort to only buy games I’m going to have time to play along with my crippling WoW addiction and wacky work schedule. I hear you there buddy. For example, if I get, say a total of 18 game hours in a week. (Days I work I might get an hour or two, the weekends 3-4, and my day off is a solid 10 hour chunk.) At least 50% of it will go to WoW. I’m trying to scale that back and play WoW from an extremely casual perspective. My current WoW game plan is to have a single 90 I can do end-game content on. (Heroics, LFR, PvP, WPvP, etc), to slowly gear up, and a few alts to level up and enjoy Azeroth, because the satisfaction I get from actually BEATING a game is really good. There are a lot of games right now that deserve my attention, and Warcraft has already recieved a good 4,000 hours of my attention or so. But I know it will get more as time goes on.